I hope you had a great weekend! You may or may not have been on spring break last week, like us! I had a restful and good spring break. I finished up some projects around my house, got some actual cleaning done, tried to catch up on my laundry, did some organizing, spent some family time, had a date night, etc. Unfortunately, I started back to work this morning. But I should have plenty of good posts coming up to show you since I had some spare time last week. First off, some simple organizing I accomplished. My two son’s share a bathroom. Their vanity has a cabinet with double doors and two drawers. I had the cabinets pretty well organized since moving in, but the drawers were a mess, so I decided to tackle those. Do you remember my post from Friday? Well, I decided to use these grey bins below in the bathroom drawers. This is the top drawer before.Just pretty much a mish mash of items. This is more of the same, but it is the bottom drawer. They are very nice deep drawers. I started by just removing everything and piling it on the floor. Then I sorted and purged. I have the grey bins for one drawer, but I needed more. I looked around the house and just could not find anything to use. Then I remembered this post I read on I Heart Organizing not too long ago. I jumped online to find it. She used Cereal boxes as drawer organizers! Genius! I had several cereal boxes. So I grabbed a couple and got to work. I used Jen’s tutorial and it worked out perfectly! Whoop whoop! Here are my cereal box bins! You have seen this wrapping paper from Target’s $1 section both here and here. I thought I would show you under the sink in the cabinets. This is pretty much exactly the way I organized it since we moved in, and it has held up very well. Here is the tour. Wee those black baskets in the back left corner? They are from Target. They have little handles that flip out so that you can stack them on top of each other. These two baskets hold travel bags and travel sized items. These things do not just belong to the boys. They belong to the family, but I had no place else to put them. The black bin in the front left is also from Target, and it holds bubble bath, spare hand soap, a cup to rinse the bathtub with, and cleaning sponges. In the front right is our first aid kit. And then you can clearly see our cleaning products. These are things I use to clean their bathroom. I try to keep cleaning products under each sink. It makes it so much easier. Mr. 13 Year Old uses the Clorox wipes to clean his shoes a lot. You can also see that I had lined the bottom of the cabinet with contact paper. I would not call it pretty, but it is very functional. Here is the bottom drawer after the organization. You can see I used my cereal box bins in the back. They hold plastic cups, trash can liners, small packs of tissues and the thermometers. In the front are the toilet paper wipes. Can’t live without those! I keep them in every bathroom. Great for cleanliness! Right there in the middle are some of Mr. 13 Year Old’s products. I am on the hunt for a bin to contain these items but have not found the perfect size, yet. This is the top drawer. The back bin contains a trimmer. The middle bin contains first aid ointment, ant itch cream, a razor and some self tanning lotion. The front bin contains combs, toothpaste, chap stick and dental floss. Over to the left is the toothpaste Mr. 5 year Old’s toothbrush, and a couple of random things. Just in case you were wondering, this is the cabinet over their toilet. I thought I would go ahead and show you the inside of it while I am at it. You can clearly see what it contains. And this is where I keep their bath towels and hand towels. It is not ideal, but it works for now. If we have company coming, I usually just pick this up and sit it inside of the shower. 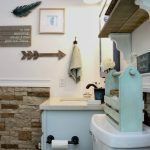 This blog is really showing the use of bathroom cabinets for everyone who wants to have an ideal bathroom should use such cabinets to keep their make up and saving kits. Organizing gives much space to your bathroom cabinets, and while keeping it tidy will save you time looking for things.